T as in Today. My cats came home! I was so excited when I went to the shelter today! Some drama at the shelter, because I was cleaning their ears. Oh my, they were really dirty! I’ll continue cleaning them at home, but we also need to come to the shelter once a week. They didn’t like the carriers at all, but you were right, the size was ok. Poor Tessa was meowing all the way home, Kajsa was silent. Once here, everything went fine. They were immediately exploring the kitchen and the hall. None was hiding. As I expected, Tessa was the braver one, but Kajsa followed her very soon. Both have eaten, and at least Kajsa has used the litter tray. I don’t really know what happened there, she was meowing several times. So which places did they like? I’m surprised, but none of them was interested in the basket on the window board. (?? I thought this would be the prime spot.). Tessa made a really weird choice: she likes to be on the stove. (??) Kajsa likes the spots in the shelf, the ones without curtains. She was doing really great! I wasn’t too concerned about Tessa, because I’ve seen that she likes to explore new places. Kajsa is very shy, and I was worried that she’d be afraid. Turned out that my belly was one of the first places she wanted to sit on! My heart opened up – my shelter visits really paid off! Karen was right – they felt saver about me than my place! Eh, our place. … and also Kajsa explores her new home. For some reason, the left shelf is better than the right shelf. Kajsa on my belly and Tessa on the stove. Now they’re both taking a nap; Tessa on the stove and Kajsa in the shelf. I’m so relieved that everything went fine! I’ll open the doors to the staircase and my bedroom tonight. They feel already very confident in the kitchen and the hall, and I think that they’d appreciate to know where I am. Question which remains: will I sleep tonight? I guess Kajsa will visit me, but I’m not too sure about Tessa. Congratulations! And welcome home, beautiful girls. Enjoy your new lives. Tessa: Our first impression is good. Food ok, human obedient. Tessa: Thank you! And thanks for making the human to take some blankets away. I sometimes prefer hard surfaces. However, I also slept on pillows today – just making sure that the human is confused. Vielen Dank! Wir lernen uns kennen und versuchen einander zu verstehen. Oder zumindestens macht das der menschliche Teil von uns 3. I’m so happy for you and your kitties! I also think it’s hilarious to see the places they choose. In all my years of owning cats, I still haven’t been able to outguess them when it comes to what places are good to sleep in. Haha!! I had a good laugh! Thank you for this link! I’ll update on their favorite places! The stove is still a great spot, but they’ve been mainly hanging out in my bedroom and staircase (what?) today. Oh, yay! What a happy post! I adopted Troy from my local cat shelter about a month or so ago, and it’s been so fun to watch him grow and change and explore the house from stem to stern. You’re in for some fun times! Oh! 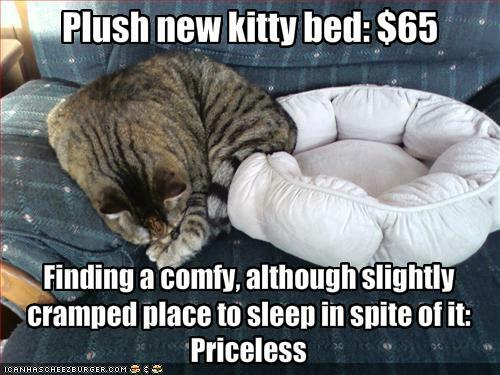 You’re also in the business of new feline flat mates! Thank you for coming over, I haven’t seen your blog before! I’ll take a closer look when I’ve more time. Oh wonderful!! And it seems it was a very positive homecoming for the girls! They look very curious which is very encouraging. Sometimes cats in new places will just hide for a while, but not these two! So your getting to know them slowly over the weeks has paid off! By the way, I think the fact you are blogging in English is very commendable. I know it can’t be so easy to do! They haven’t been that curious today. They don’t hide, but they preferred to be in another room than me, which is of course fine. Both have been greeting me though and showed me that they like me, so I think we’re on a really good way. Thank you for your compliment! I’ve to admit that English isn’t my most favorite language. I’m dealing with three languages in my everyday life (Swedish, Finnish and German), but I hardly SPEAK English. English is an academic language to me, so it’s challenging to write informal English. It’s ok most of the time, but I get so confused when I’m tired. I am even more impressed now that I know English is your 4th language!! Kajsa: Tessa and I are happy. Ok, most of the time. Tessa is sometimes really annoying, so I just need to show her where her place is. It’s me who’s the boss! The human is also happy, but she looks confused. We like it that way, because it makes her do more things for us! Welcome home, girls! Your adventures have only begun. Kajsa and Tessa: Hehe. You’re right. We’ve big plans! Yay! Welcome, Kajsa and Tessa! We know you’re gonna love your new home! Kajsa and Tessa: we do! We’ve to admit that we didn’t want to leave the shelter, but we had no idea what was waiting us! Oh I am so happy for you! This is great and they are fitting right in. I bet they may even sleep with you. I have woken up to one of the cats on my chest, the other between my legs, the 3rd by my hubby’s legs and the 4th under the blanket nestled in with my hubby. He can make some sort of tent using his arms and they can be all comfortable. Congratulations! Wow! How big is your bed? This sounds so cozy! I slept most of the time alone, but they (or only one of them, I don’t know) was having a look at me several times. We are so pleased this went well. They will soon settle to their favourite places – including your lap. We hope one or both of them snuggled with you overnight. And just remember – they are in charge now! They truly are! But for the moment, they’re still a bit afraid. When I say ‘ei’ and move towards them, they’re running away. Let’s see how long it takes until they start ignoring me. Thank you for your wishes! I’m not really sure what happened tonight, I woke up several times, but as far as I know, they didn’t sleep in my bed. Thank you! We’re all a bit tired today, but we’re doing fine!